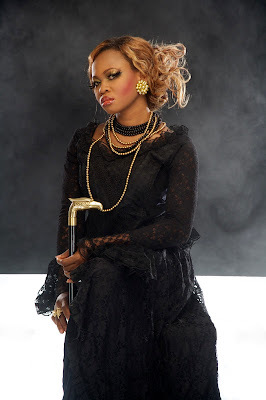 Not many know her as Susan Olubimpe Harvey, but that is the real name of Kennis music’s Goldie. One of Nigeria’s most celebrated music diva.She has been able to mine her music talent far from its unappealling raw stage to becoming a precious metal shining into the hearts of her fans and making a name for herself in an industry cluttered with talents.In her words:’I have always been into music as far back as i can remember .I remember composing songs when I was a kid and teaching my younger ones.I remember creating little poems that detailed how I felt on an issue or a particular subject matter.In the U.K, I was part of an informal pop rock band and we perform all over the place for friends and family’ Goldie said. top.Narrating she says:’There was a sort of question mark as to people’s perception of m y identity.I think my blonde hair and my “avante garde” mode of dressing kind of threw people off a bit.So the connection was a bit off.Peope didn’t just get me’. Born and bred in Lagos , young Goldie attended Greensprings primary school. After that she went to Saint John’s college and proceeded to the U.K for a degree in Business management from the University of Sunderland, U.K. Refusing tom take a back seat in her music career,instead being its driver she has clinched several awards including the Best Afro hip-hop video at the 2011 N.M.V.A, and emerging the Best hip hop female award winner at the City People entertainment award.She was also inducted as a celebrity special Marshall November 2011 being the only female artiste among her peers.Goldie states that the Nigerain music industry is in the best place it has ever been, at least from a global recognition stand point.According to her,:’There have been collaborations across borders,which was formerly unheard of, a pipe-dream.Our music and videos are also comparable on a very international scale.What I’d love to see though is proper structuring in terms of accountability, record sales,proper royalties’. So what exactly makes Goldie tick?’My passion and love for what I do, the love and support of my fans and my relationship with God.God is the reason for all my success.I bless and give him thanks daily. Armed with an unconventional branding, compelling stage presence, in addition to her drive and dedication to her craft, Goldie continues to push boundaries, shining through and he story is truly an inspiration.